Passive PoE - means that input and output voltage are equal. Works with most DC powered non-PoE devices. Power supply required for power input - simply use the power supply (wall transformer) that is provided with the device you are trying to power. Uses industry standard 5.5mm x 2.1mm power plugs. 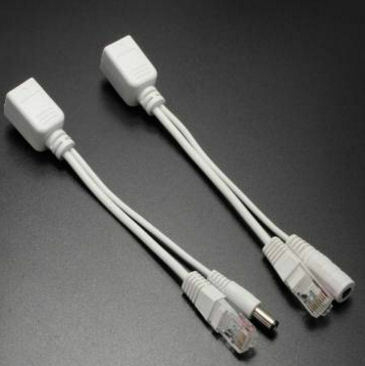 Power Over Ethernet SET is applicable for wide range of network products such as Access Points, Routers, IP cameras, modems, switches, embedded computers or other network devices. Passive Power over Ethernet SET is compatible with most devices available on the market such as D-Link, Linksys, Airlive, Senao, Wline, Micronet, Edimax etc.